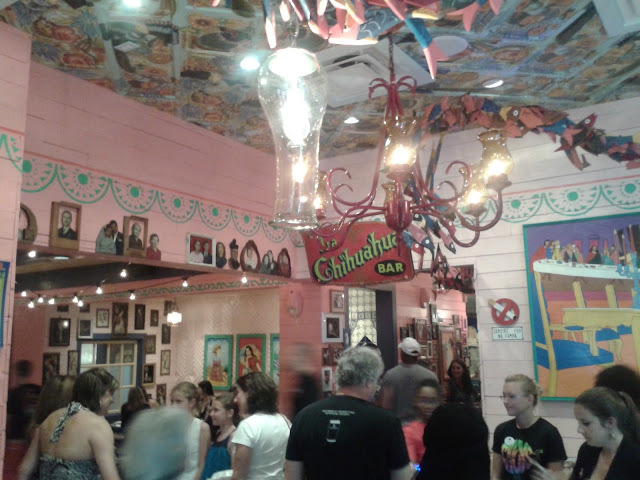 I dined at Chuy's on Wednesday evening. The Austin, Texas-based Tex-Mex restaurant chain opened a location in SouthPark less than three weeks ago. There are 44 (and counting) Chuy's restaurants across Texas and the Southeast, and this is the first in North Carolina. On the way there, when I found out it was located in the space that formerly housed Zink American Kitchen, which first was the home of M5 Modern Mediterranean (both formerly run by Harper's Restaurant Group), my exact words were it was an interesting location for a Tex-Mex restaurant because the prior decor and layout were very upscale (M5 was a hotspot for socialites and local celebrities in its heyday). Well, Chuy's has completely renovated the space and made it its own. 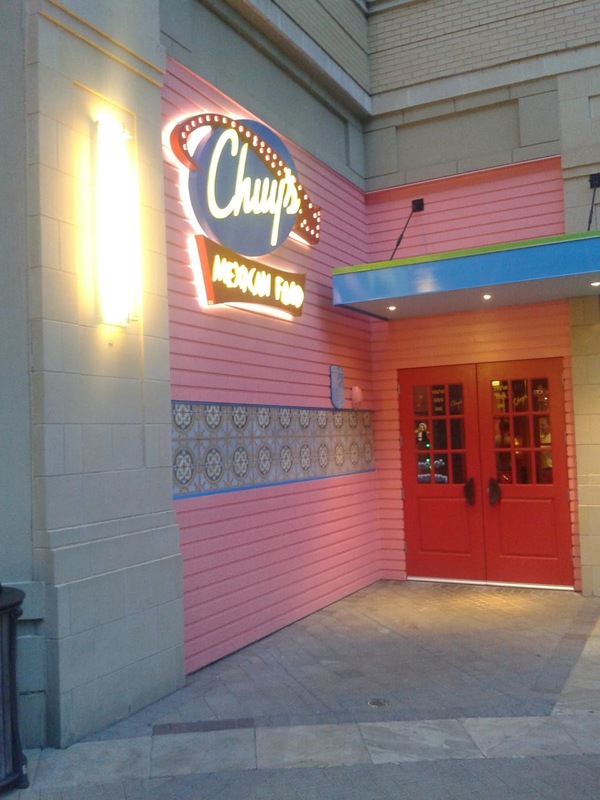 One of the company's slogans is "If you've seen one Chuy's, you've seen one Chuy's," meaning each location has a personality of its own. 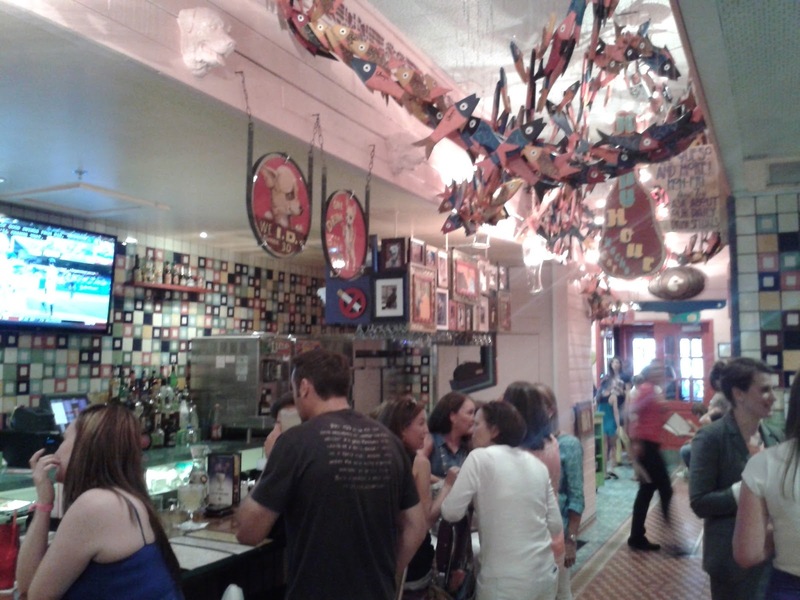 But they all have signature elements of the decor in common like bright colors (flamingo pink is how I describe it) from the floor tiles to the walls, ceiling, and furniture, metal palm trees and funky art. It's intentionally tacky, which makes it appealing, reminiscent of a cheap, 1970s-era Las Vegas diner or casino. 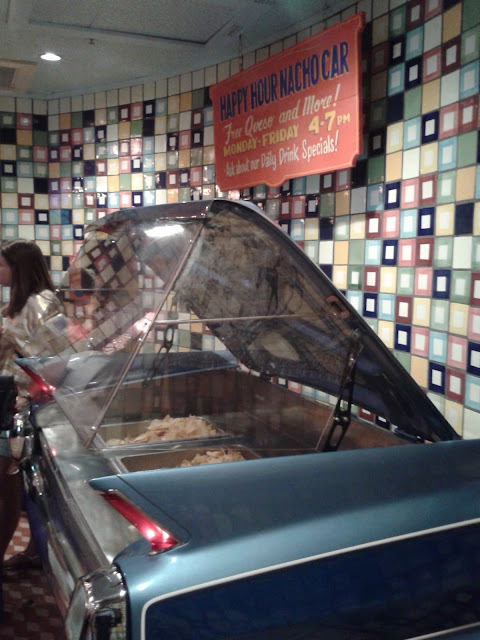 When we arrived to Chuy's around 7:15 p.m., the hostess said it would be about a 45-minute wait. 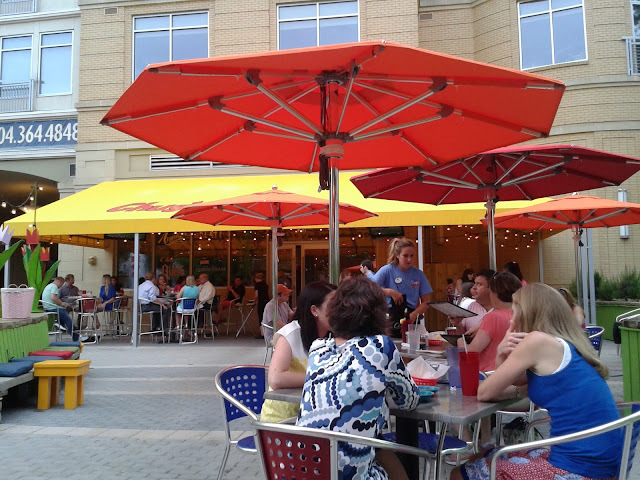 (Side note: Chuy's is in The Village at SouthPark next door to The Cowfish Sushi Burger Bar, making it one of the most in-demand restaurant corners in the area.) So we went to the bar and ordered margaritas, I grabbed a basket of complimentary nachos and salsa from the Nacho Car, and we sat on a bench on the patio. Luckily, our wait time was only about half of what the hostess previously estimated, so we only had about a 25-minute wait overall. We were seated on the patio, which was great because the weather was pleasant for a July night (it wasn't hot thanks to all this rain we've been getting). Decor and ambiance aside, we all know that the most important element of a restaurant is the food. I ordered the No. 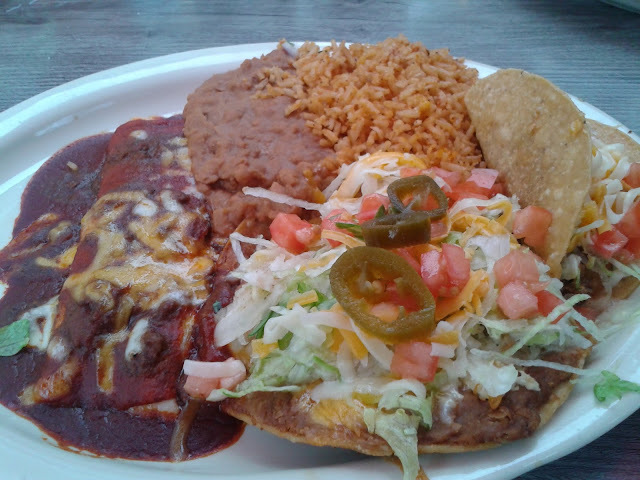 6 combination--Enchilada, Taco & Chalupa--which is described on the menu as a cheese Tex-Mex enchilada, seasoned ground sirloin crispy taco, and chicken chalupa, a homemade corn tortilla fried and topped with refried beans, cheese, freshly-roasted, hand-pulled chicken, lettuce, tomatoes and jalapeños. I also chose Mexican rice and refried beans from the options of accompaniments. The meal was delicious. If I had to point out particular standouts I would say I was most impressed with the enchilada and Mexican rice--some of the best I've ever had at a Tex-Mex restaurant. Chuy's, at The Village at SouthPark, 4310 Sharon Rd., 704-364-3959, www.chuys.com, facebook.com/chuyscharlotte. Hours: Mon.-Sat., 10 a.m.-9 p.m.; Sun., 12:30-6 p.m.